Fashion | Beauty | Body Positivity | Lifestyle | Pop Culture: Trend Spotting: Bright Coloured Tights. i'm wearing red ones the whole winter! You're most welcome. I love the red ones too. 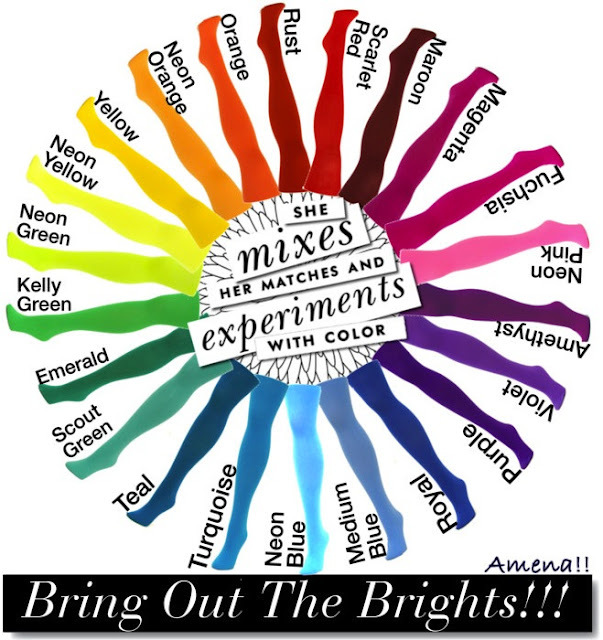 found you on IFB :) I love this post on colored tights. I especially heart the picture with the orange pair... must find some of my own to add to my already-full drawer haha. What a fun post! And that outfit by Atlantic Pacific was my favorite EVER. Thanks so much for stopping by my blog and commenting :) I'm now following you. Thanks Sarah for the support and your kind words. I have a whole drawer of colorful tights - the one color I don't have that I really want is red! And that picture above makes me need to get a red pair ASAP. Great post. I found your blog when we were both featured on IFB this week. I'm a new follower. Would love for you to stop by my blog sometime and say hi! I love tights. I also love collecting them. I agree it`s perfect for winter. I always like to add a splash of color & these are perfect shades. Bright tights are awesome, I wish I owned more! Love the colored tights!! Great post! !